Declan Nwachukwu scored a hat-trick as Horsham ran in eight tries to get their London 2 South East season off to a flying start away to relegated Maidstone. It was the first meeting between the two in six years, with Horsham being trashed 95-12 the last time in March 2013 at the Mote when Maidstone became London 3 South East champions. 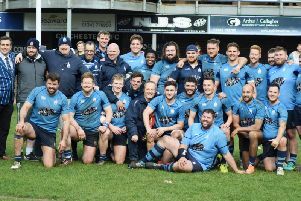 The Kent club had an exceptional side at the time which secured back-to-back promotions into London 1 South and Intermediate Cup success at Twickenham. Having been relegated from London 1 South last season, it was somewhat of an unknown quantity, but the Green and Whites put on a sterling show. With the exception of a scintillating try by Nwachukwu, Maidstone dominated territory for first 30 minutes, but lacked the ability to breakdown a resilient Horsham defence. Maidstone’s Euan Caborn missed a kick at goal which they were to soon regret when Nwachukwu rounded his man and accelerated away for a score in the corner after Michael Tredgett had run hard at the home defence. Maidstone continued to attack but were profligate in their finishing when Vince Everitt ripped the ball off his opponent over the tryline to prevent a certain score. The home side pegged Horsham back with a penalty from Caborn but it was a yellow card on the half hour mark for preventing a quick penalty that opened the flood-gates. Michael Tredgett scored with a back-row peel off a five-yard scrum supported by Jamie Redmayne. Caborn put over a penalty but then the four-try bonus point was secured with two tries in three minutes from Nwachukwu and Rich Tredgett as well as a Johnson conversion which gave Horsham a 24-6 lead at the break. Johnny Ordidge intercepted a loose pass deep in Green and White territory, and with the supporting Everitt there was an inter-change of passes through a broken defence for Everitt to finish off the try under the posts. Maidstone came back with a well-worked try by Ollie Newton in the corner, but the result was secured with two tries in quick succession when the ball was spun wide after a dominant scrum for Jordan Bell to score in the corner. Nwachukwu then secured his hat-trick with a try in the corner following a length of the field handling move. Horsham led 43-11 after 60 minutes. Maidstone’s Ryan Murphy touched down before debutant Joe Blake scored his first try for the 1st XV. There was still time for Maidstone to add some gloss to the scoreline with a fine try by Newton in the final minute. Assistant coach Richard Bell said: “You have to be pleased with a bonus point win away from home from against a side in London 1 last season! I was even more pleased with the quality we showed across the pitch, clinical finishing, good shape and structure in both attack and defence and scoring eight tries. “The five players making their debut Jamie Redmayne, Joe Reid, Ted Powell, Chris Double and 18-year-old Joe Blake all made a big impact with Blake rounding of a very good performance at 10 with a try. We gave away too many penalties which we will address during the week and left 15 points out there. Horsham continue their league campaign on Saturday at home to Beckenham. Horsham: J.Bell; Nwachukwu, Ordidge, Johnson, Double; Blake, Mills; Reid, N.Bell, Powell; Goward, R.Tredgett; Redmayne, Everitt, M.Tredgett.